Preview story: Sacramento teachers will gather at Sacramento State on Friday, July 29 for the second annual Better Together: California Teachers Summit, a free statewide day of learning and networking open to all California PreK-12 teachers, teacher candidates, school administrators and other educators. 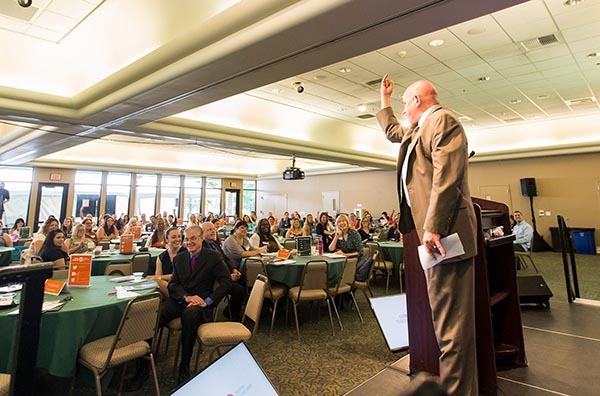 One of 38 locations across the state, Sac State invites the region’s teachers to share ideas, join a teacher network, and learn effective strategies for implementing the new California Standards in their classrooms. Running from 8 a.m. to 3 p.m., the summit will take place at the Leslie and Anita Harper Alumni Center, 6000 J St. And for the second year in a row, State Superintendent of Public Instruction Tom Torlakson will provide opening remarks to the sold-out Sac State crowd of more than 300. A unique partnership was formed among the Association of Independent California Colleges and Universities (AICCU), the California State University (CSU), and New Teacher Center to host this free statewide day of learning. Through their strong and distinct networks, the organizers will reach educators at every stage in their development: new and veteran teachers, current teaching students, and alumni. During EdCamp sessions, teachers will pick topics – ranging from employing technology in the classroom to improving literacy in early education, to boosting science, technology, engineering, and math education – and exchange ideas with colleagues throughout their region. The TED-style EdTalks will feature local teachers sharing strategies and classroom victories in implementing the California Standards.